I had a vision of bringing South African home decor products to the UK. I started my journey in Cape Town, and found a team of people to design, make, source and supply my products to make my vision a reality. I also found artists and craftspeople who"s work surpassed my imagination. 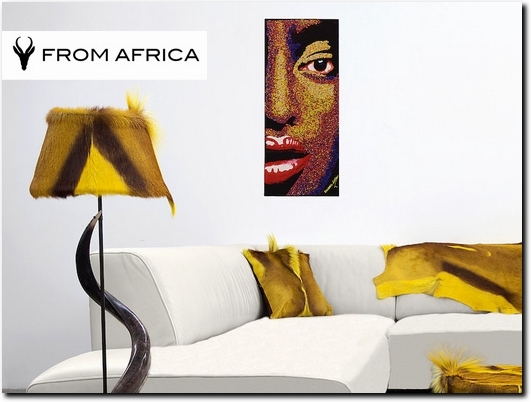 All From Africa"s products are beautifully handmade to the highest quality. Each person who works with animal by-products has to be licensed and adhere to strict South African wildlife laws. All animal by-products are obtained through legitimate culling and certified by Cape Nature Animal Conservation. No animal by- products used are from a protected species. It is critical to cull some herd species in smaller game reserves as the herds start swelling to a point where they start running out food, and ultimately all grazing animals will starve. learn new skills, giving them better prospects for the future and a better standard of living. I hope you will love my products as much as I do. UK (London) based business providing handmade home decor items for sale. Website includes e-commerce facilities, delivery and returns information, terms and conditions, associations & press mentions, full contact details.